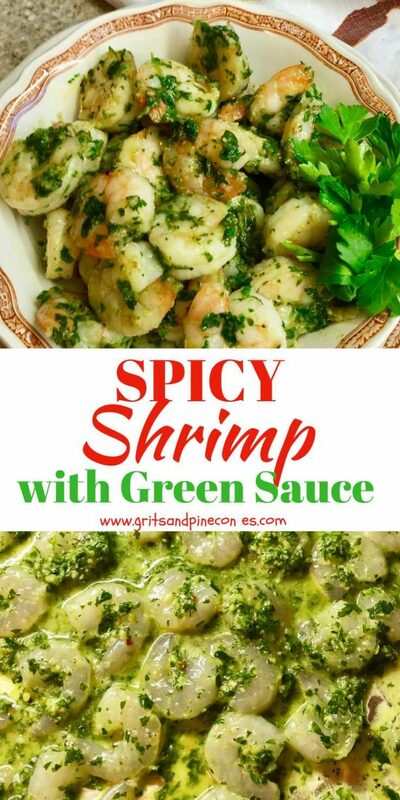 Ditch the green beer this year for St. Patrick’s Day and try this healthy and delicious recipe for Spicy Shrimp with Green Sauce. It’s an easy, healthy 20-minute dish the WHOLE family will love! I have to admit that the name, Spicy Shrimp with Green Sauce at first glance sounds a little weird. 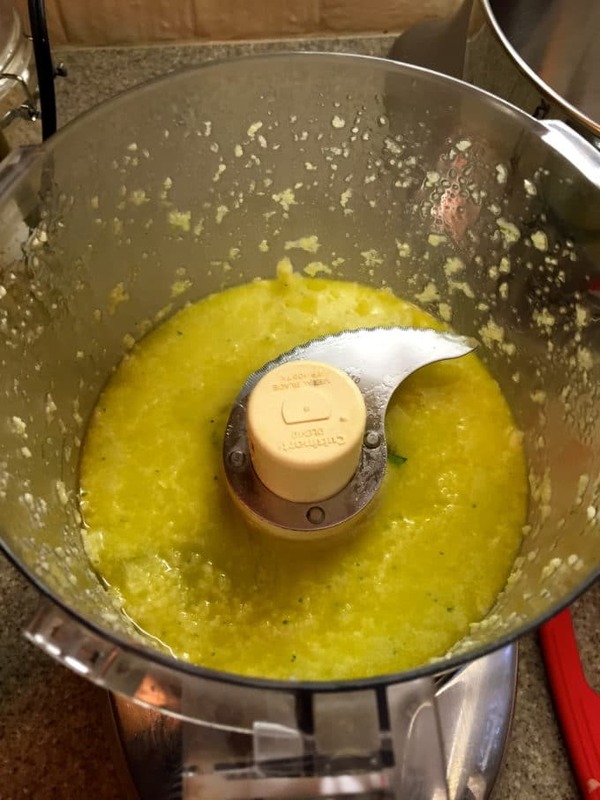 I originally thought about changing the title to something a little more glamorous like Shrimp with Salsa Verde, but the sauce isn’t quite a Salsa Verde or even Shrimp with Chimichurri, but the sauce also isn’t quite a Chimichurri either. So weird or not, you will just have to take my word for it, that you will love, love, love this quick, easy and best of all healthy recipe. These shrimp are delicious either hot right out of the oven, or you can serve them cold. Plus I have a bonus for you! Leftovers, that is if you have any leftovers, are the perfect filling for a delicious appetizer, Shrimp Puffs. So really you are getting a BOGO here! Two for the price of one! Both delicious in their own right and both are dishes I know your family will love! 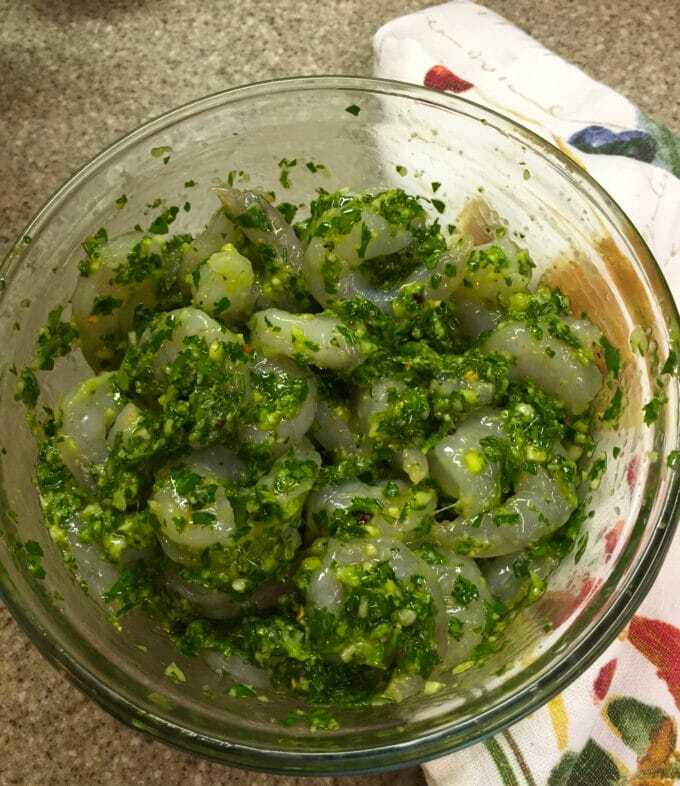 So if you make the Spicy Shrimp with Green Sauce today, be sure to save about a cup of the cooked mixture for your Shrimp Puffs, or better yet, get 2 pounds of shrimp because there really is enough sauce for 2 pounds. 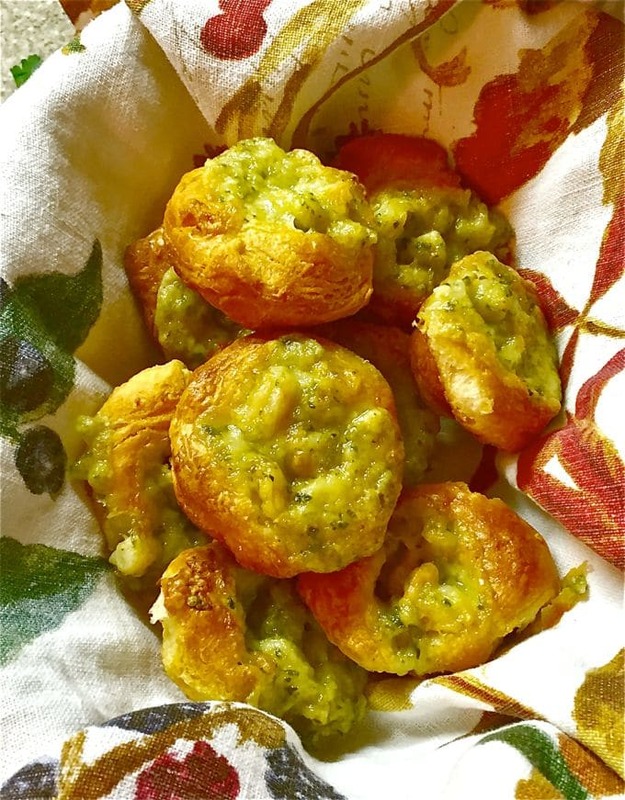 Looking for more Irish inspired food for St. Patrick’s Day, check out my Ten Irish Recipes for St. Patrick’s Day Roundup. Or, if you love shrimp as I do, you might also be interested in these delicious and popular shrimp recipes: Brown Sugar Glazed Bacon Wrapped Shrimp, Quick and Easy Buffalo Shrimp, and Delicious Shrimp and Blue Cheese Pasta. Need more ideas, check out all of my shrimp and seafood recipes here SEAFOOD. 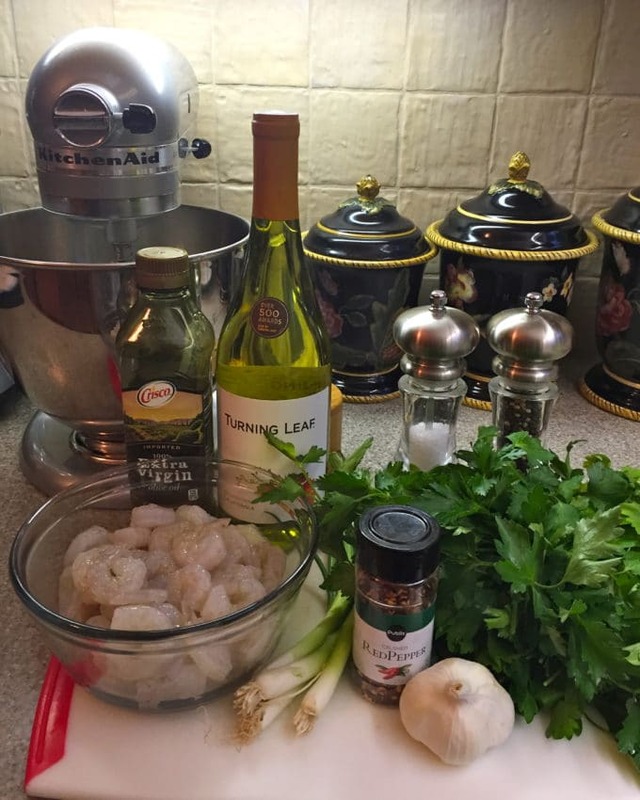 You only need a few ingredients for Spicy Shrimp with Green Sauce: shrimp, lots of garlic and parsley, olive oil, scallions, red pepper flakes white wine and salt and pepper. To get started, combine minced garlic with olive oil and blend until smooth in your food processor fitted with a steel blade. Add parsley and scallions and pulse just until the mixture is minced and looks about the consistency of pesto. Put in a medium bowl and toss with your shrimp, wine, salt and pepper and a pinch of red pepper flakes. Mix well, cover and refrigerate for about 30 minutes or so, to let the flavors blend. Pour the shrimp mixture out onto a large baking sheet lined with foil. And, roast for about 10-15 minutes or until the sauce is bubbly and your shrimp are pink and cooked through. That’s it! I told you it was easy. Despite its plain name, Spicy Shrimp with Green Sauce, this recipe delivers big on its promise of great flavor. Ditch the green beer this year for St. Patrick's Day and try this quick, easy, and healthy, 20-minute shrimp recipe the WHOLE family will love! 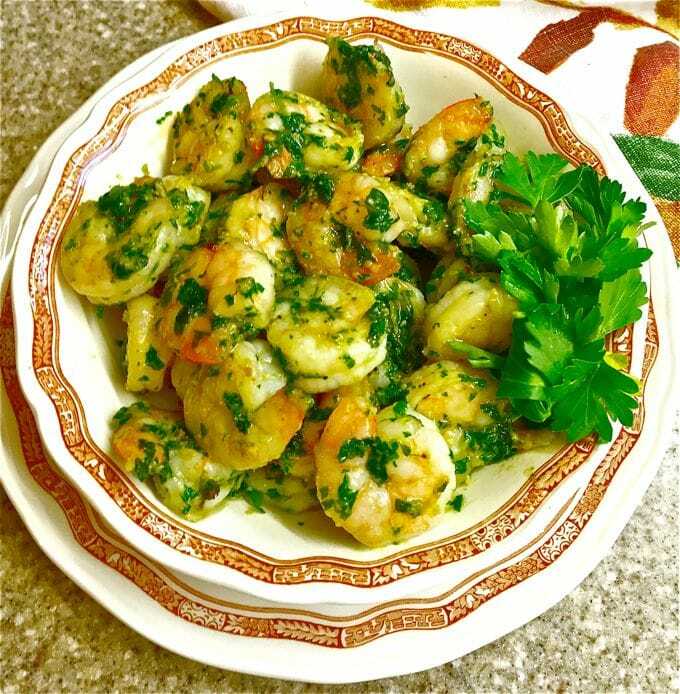 Spicy Shrimp with Green Sauce is full of garlic and parsley, scallions, red pepper flakes, white wine, and shrimp and makes a great weeknight dinner! 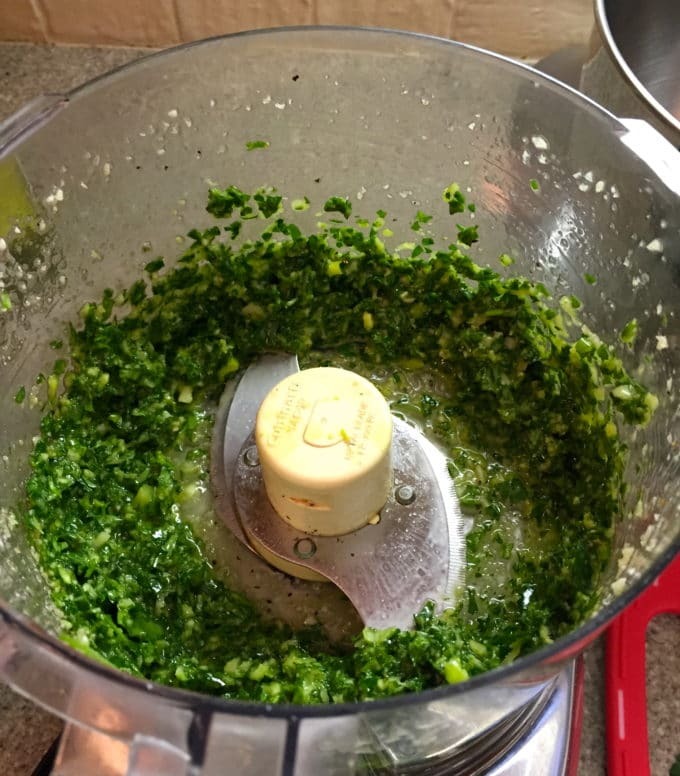 Add parsley and scallions and pulse just until the mixture is minced and looks about the consistency of a pesto. Put in a medium bowl and toss with your shrimp, wine, salt and pepper and a pinch of red pepper flakes. Mix well, cover and put in your refrigerator for about 30 minutes or so to let the flavors blend. 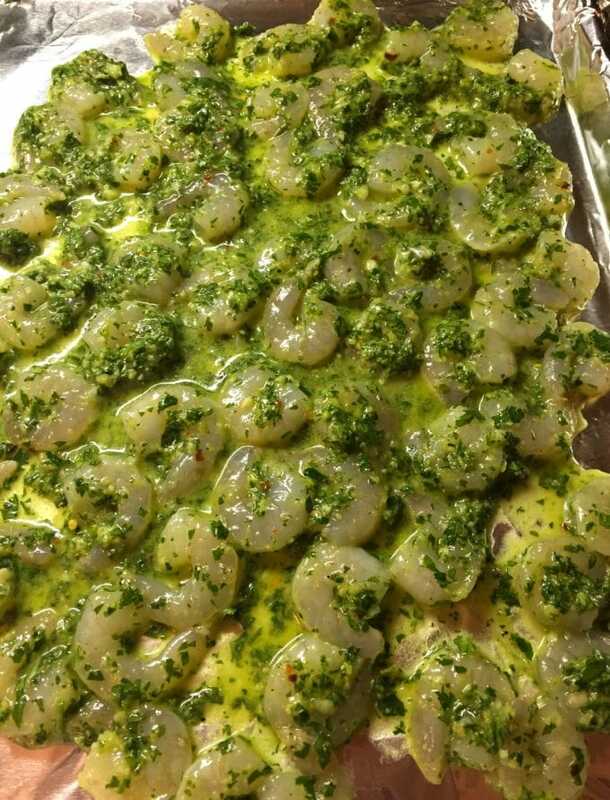 Pour the shrimp mixture out onto a large baking sheet lined with foil and roast for about 10-15 minutes or until the sauce is bubbly and your shrimp are pink and cooked through. Oh my, everything I’ve seen on Grits and Pinecones looks so good! I’m coming over to YOUR house next trip to Pensacola!! Yum, yum!❤️? ?